Please accept my blessings. I beg to acknowledge receipt of your letter dated 21st May, 1970, and noted the contents carefully. Regarding the Sanskrit class, I think it was only a plea, but he wanted to teach us something other philosophy. Our Temple is meant for our men, and we may have our own discussions amongst ourselves, no outsider needed. It is definitely concluded that we have not got to learn anything from any outsider beyond the jurisdiction of Gaudiya Vaisnava philosophy. Our philosophy is established on sound ground of the conclusion arrived at by Vyasadeva down to Jiva Goswami, Visvanatha Cakravarti, Bhaktivinode Thakura, etc. The other day one Indian boy came here to take permission for chanting some bhajan, so I indirectly refused. Try to understand our own philosophy described in so many books, but I cannot allow you to hear form the mental speculators without any solid knowledge. So it is very encouraging that London Temple is being managed by one pair of husband and wife very nicely. Similarly each pair should take care of a center; and if you love me at all, then all of you try your best to open at least 108 centers during my lifetime - that is my special request. At the same time, we must be very careful to see that every center is going properly. Our possessing own building is not so important as it is important to see that everything is going on nicely in order. Yesterday I received one very important magazine, Kalyana, from India in which the editor has described about our activities so nicely, but at the end it has been remarked whether in future the standard shall continue. Of course we are not very much concerned with the future; at least in our presence who are the floating members of this Society we should like to see things going on properly. You have described Their Lordships Sri Sri Radha Krsna at London Temple as wonderful. Yes, that is the test of standard service. If we see the Deities in very pleasing mood, that will certify our service unto the Lord. So everywhere we shall see the Deities in such pleasing mood. As soon as we see the Deities in a different mood we must immediately understand our discrepancies. Regarding your proposed agreed upon program to send each householder couple to a different European city to open a center there, and then having the center firmly established, join the World Sankirtana Party is very good. This program is approved that first we establish some more centers. My missionary activities are especially meant for the Western countries. To go to India is a secondary question, the primary thing is that we establish our institution firmly in the Western countries. So when we are sound in our preaching work in the Western countries, that news automatically goes to India as it is already publicized. So if Krsna desires, we may go to India next year with our party, but I will prefer if George takes the responsibility of this touring party. If he is serious about it, I can give my suggestions about how it will be done. As you have listed the prospected cities with the respective couples of householders to go there, these programs are very encouraging. In England there are some very important cities like Manchester, Liverpool, Glasgow, etc. so these may be gradually incorporated in your program. Regarding the members comprising the World Sankirtana Party, on the whole I wish that 40 members will go, one half from Europe and one half from America or as it may be suitable, there is no definite restriction. So far the proposal of the Karachi Gujarat Hindu Union and the Brahma Samaj to take our devotees to Africa, if they give return fare we will go to Africa, but I am not very much hopeful of the Indians there. They may be of the same type as they are in England. The difficulty with the Indians is that they are under the impression that they know everything and they have not got to learn anything from us, but factually most of them have lost their original culture and they have to learn so many things from this Krsna Consciousness Movement. Regarding decreasing the number of copies of KRSNA book ordered by Syamasundara, no, Syamasundara must sell at least 2,500 KRSNA books, that is already decided. He can sell them at the best price, it does not matter whether it is the price mentioned on the book cover. So if you want to see a Spanish edition of BTG, then you go to Spain and open a branch, then we get Spanish edition also - it is not difficult. It is very good news that several new boys and girls have joined the Paris Temple, so utilize all these newcomers - whatever capacity they have got try to utilize it for Krsna's service - that will be good for them and good for us. Regarding your two questions, the first, Sri Gadadhara is expansion Radharani and Srinivasa is the expansion of Narada Muni, or in other words they are the internal and the devotional energy respectively. You can sing individually the names of the Gopis, there is no harm, but when we sing the prayer "Sri radha krsna padan sahaguna lalita sri visakhan vitams ca" this includes them all. Please offer my blessings to your good wife, Madri Dasi, and all the boys and girls at Paris center. Please accept my blessings. I beg to acknowledge receipt of your letter dated 21st May, 1970, along with the letters and beads from Roger and Bob. I have accepted them as my initiated disciples as you have recommended, and their beads and reply letters have been dispatched on Sunday May 24th, I hope you have received them by this time. Please continue to see that these two nice boys and all the other devotees there are following rigidly the scheduled program of regulated activities in devotional service, chanting the rounds, attending classes and studying our philosophy as well as going on Sankirtana, etc. I beg to thank you very much for the check of $200 which you have sent to Gargamuni. I am very much pleased to learn that $50 of this check was collected by the two new students as guru daksina, that is the proper execution of the initiation function so everything is complete to the Vedic standard. I have also received the newspaper clipping enclosed by you, it is a nice picture. The newspapers are beginning to appreciate our Movement more and more and that is an index of popular feeling. I am very happy to hear that you are expecting to visit our Los Angeles Temple sometime soon, so it will be a great pleasure to speak with you then. I am looking forward to your arrival. Please offer my blessings to your god wife, and all the other devotees of Detroit Temple. Hope this will meet you in good health. Please accept my blessings. I beg to acknowledge receipt of your letter regarding paintings for the KRSNA book. We have now received the full set of paintings for the first volume of KRSNA book, and they are all very, very excellent. So your art department is doing very nicely, and surely the production will improve even more by the grace of Krsna. You are all being inspired just how to portray the Lord and His associates for the devotees' eyes, so everyone who sees to these transcendental pictures will turn to become devotees - that is our aim. Yes, when Krsna and Balarama were students of Sandipuni Muni they may be shown with shaved heads and sikhas, kunthi, etc., just like our brahmacaris. The personified Vedas are just like great sages in appearance. Some of them may be looking like Vyasadeva, Valmiki, Narada, etc. Some of them are older and some of them are younger, some of them have full hair like Vyasa because they are householders and others are brahmacari--but they are all great souls, highly elevated in transcendental science, or Paramahamsas. So as you suggest these pictures will be needed for illustrating the long portion of text describing their prayers to Garbhodakasayi Visnu. This is a very important chapter, and if possible it should also be very appropriately illustrated. So you are very able to choose out suitable subject matter for the pictures, then execute them carefully for Krsna's satisfaction. If you are requiring any other informations like this, please write your inquiries to me and I shall be glad to give you the proper direction. Please accept my blessings. I beg to acknowledge receipt of your letter dated 15th May, 1970. I know you are sincere servant of Krsna, so sometimes we may do something which is not very congenial, but Krsna is so kind that one who is engaged in His transcendental loving service is corrected immediately from within as Krsna is sitting within everyone's heart. So you have gone there with a great responsibility on behalf of Sri Caitanya Mahaprabhu, and try to convince people about the importance of Krsna Consciousness, that will make everything nice and in order. You have asked some specific mantra; there is no other greater mantra than Hare Krsna. Srila Bhaktivinode says, "When I chant Radha Krsna or Hare Krsna all my dangers are gone immediately." So which other mantra can be more effective than Hare Krsna? So far responsibility is concerned, there is an action in Bhaktirasamrta Sindhu to be executed by the devotee which is called "Krsna arthe akhila cesta" which means to take all kinds of responsibilities for Krsna's sake. Sometimes I also think that let me go back to Vrndavana, in that peaceful situation, to live without any responsibilities. Still, in this old age, I take the responsibility of managing our quite a big Institution now, and I have to reply so many letters from different centers to give them instruction. As an old man I can take relief from this work immediately, but for Krsna's sake I am pulling on even though there is sometimes personal inconveniences. So let us act in that way all together for Krsna's sake. Regarding using our Temple for marriage ceremonies for the Hindu community, if they contribute something to the Temple they can use the Temple and perform the marriage with their own priest, but we cannot take responsibility for marrying others who are not initiated by us. I beg to thank you also for the nice picture. I have kept the picture on my table, it is very nice. May bless you Gopala Krsna. Please accept my blessings. I beg to acknowledge receipt of your letter dated 14th May, 1970, and noted the contents. I am very glad to learn that you have decided to live in Sydney. Sydney is your jurisdiction, so you cannot leave this place unless there is very urgent engagement in other place. You have got to organize this center very nicely and Krsna has sent you already some help in the shape of a nice actress who is willing to help us in any way. Please try to convince this girl about our Krsna philosophy. You are already experienced and sincere worker, if you try to convince her, Krsna will help you from within. Our Isopanisad book will be easy for anyone to understand about God-consciousness, then there are other small books like Three Essays, Krsna Consciousness: the Topmost Yoga System, Easy Journey to Other Planets, etc., so let her read all these things. So as you have no resort than myself, so I have no other disciple than yourself who can take care of organizing Sydney center. Please do therefore everything with enthusiasm. That will satisfy me, and Krsna also, and as a result of which you will be satisfied transcendentally - this is our position. While posting this letter I have received your letter dated 22nd May, 1970, and I am so very much pleased to know that everything has been resolved so nicely, and Sydney center has moved to a larger and better location. All these are very good news, and I beg to thank you very much. Hope this will meet you in good health. Please accept my humble obeisances. I beg to thank you for your kind letter dated 14th May, 1970, and noted the contents. I last met you sometimes by the 11th or 12th of December 1967 at Mullick's Radha-Govinda Temple, and then I started for U.S.A. via Japan sometimes on the 13rd December, 1967. When I was staying in a hotel of Tokyo I immediately sent my arrival news to Sripada Tirtha Maharaja offering my respects therein to you, but on my return to San Francisco from Tokyo I did not receive any letter from you although my return address was given in the letter which I wrote from Tokyo. Anyway that is a long distant topic. I am very pleased to receive your letter as I was expecting at every moment. 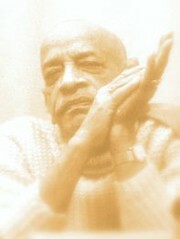 I hope by the grace of Srila Prabhupada you are doing well. I am so glad to note that you remember the auspicious day sometimes in 1944 when I started my Back to Godhead magazine. I think in the first issue you wrote some article also, and you took the trouble of going several times to the Sarasvati Press for supervising the printing work. It is a great pleasure to remember those days of cooperation. You rightly remember that His Holiness Bhakti Saranga Goswami presided over the meeting in which our revered Kesav Maharaja also participated. But at that time on account of my selecting Goswami Maharaja to preside over the meeting, Sripada Tirtha Maharaja (then Kunjada) and Bon Maharaja also refused to accept my invitation. Anyway, by your blessings Back to Godhead although passed through many difficulties is doing well. First of all it was published in Calcutta, than in Allahabad, then at Delhi. In this way at last it has come to U.S.A. and my American disciples are taking care of this transcendental magazine. You will be glad to know that we are printing now 125,000 copies English edition, and 15,000 copies each of French and German editions. These are coming out every month, and very soon, maybe from the next month, we will issue a similar quantity in Japanese language. We have got now 30 centers, and in each center the devotees are going to the streets of London, Hamburg, New York, Los Angeles, San Francisco, Tokyo, etc, and they are selling Back to Godhead and other books very nicely. The magazines are sold in each center at the rate of 100 to 400 copies daily, and the price is $.50 per copy which is in Indian exchange Rs. 3.50. Since I have come here we have published many books like Bhagavad-gita As It Is, Teachings of Lord Caitanya, Sri Isopanisad, Krsna Consciousness: the Topmost Yoga System, Nectar of Devotion, Krsna, and several essays; and I have already sent one copy of Bhagavad-gita As It Is to Sripada Tirtha Maharaja, I hope you have seen it, it is published by MacMillan Company. So things are going on by the grace of Srila Prabhupada, but I am getting older, naturally the energy is not so strong, but still I hope to prolong as you all Vaisnavas are praying to Srila Prabhupada that by His grace my life may be prolonged and energy safely guarded. So far I see on the list of complimentary copies of Back to Godhead your good name is there as well as Sripada __ Maharaja and Sripada Tirtha Maharaja, so I think you must all be receiving regularly the copies as they are published. Sometimes they are delayed by accidents like postal strikes, otherwise your copies are regularly dispatched. I beg to thank you very much for your letter dated 15th May, 1970. I am very glad to learn that some article has been published in your esteemed paper, Kalyana, regarding my activities, and I thank you very much for this. I have not seen the article as yet because if you have sent the specimen copy by ordinary post, then it will take about four months to reach here. If therefore you send me one copy by air mail, it will be a great pleasure for me. Regarding the translation of Krsna Consciousness, I think the following lines either in Bengali or in Hindi will be alright. P.S. As you have asked for my suggestion, I would request you to formulate a scheme so that our Indian brothers interested in Krsna Consciousness may join this Movement and send many preachers all over the world. There is a great necessity of qualified preachers. So far Krsna Consciousness philosophy is concerned, it is now tested by my last three years' experiment that this philosophy will be accepted in any part of the world irrespective of caste, creed, color, and language. Besides that, many of my students are eager to go to India, but I have no place of my own in India to accommodate them. If suitable place can be obtained, at least 40 American and European students may immediately go to India and preach this cult in colleges, schools and universities, and other public meeting places. I will be glad to know if you can help me in this matter. By separate air mail I am sending several news articles, out of which my talks with Dr. J.F. Staal, Professor of Philosophy and of South Asian Languages, University of California, Berkeley, will be very much interesting to you. So we are gradually being appreciated by all classes of men. The above picture is our newly purchased building as I informed you before. Please accept my blessings. I beg to thank you for your very nice letter dated 21st May, 1970, along with a set of beads. I am very glad to note your humble attitude, so keep this nice state of serving mood and your success is guaranteed in Krsna Consciousness. So I am very happy to accept you as my initiated disciple, and your initiated name is Sri Govinda Das Brahmacari. I have chanted your beads duly and I am returning them to you enclosed herewith. Please continue as you have been following the regulative rules and principles strictly and always chant sixteen rounds of the Holy Names daily. It is very good that you are presently engaged in assisting Bhagavan das by taking care of the treasury and distributing incense, you may continue to expand this engagement and at the same time learn thoroughly our Krsna Consciousness philosophy and how to apply it practically. You can take all help from Bhagavan das in these matters, he is a very qualified devotee. Therefore do not waste even a moment of this rare opportunity of human form of life. Chant Hare Krsna, be always finding out some engagement in the service of the Lord, and be happy, and by the grace of Krsna you will be freed from all contaminations of this material condition and become fit for realizing the highest perfection of life, Krsna Consciousness. P.S. I am enclosing herewith one sheet listing the standard practices for a devotee and also the qualifications of a devotee. Please accept my blessings. I beg to acknowledge receipt of your letter dated 16th May, 1970. I am very glad you are coming here by the 6th of June next, and it will be a great opportunity to discuss at that time about New Vrndavana, and other affairs. Your remark on the student demonstration is quite appropriate. Srila Bhaktivinode Thakura said that materialistic knowledge is another expansion of the influence of Maya. The result of material education is that the living entity forgets his own identification and takes to the business of a particular type of body which is given to him by the grace of Maya. The Vedic education means one has to understand his real identity as brahman or the spirit soul. Unfortunately the modern educational system is so defective that everyone is educated to accept this body as self. At the present moment they have no clear idea of identification, so much so that even a person who is partially advanced about the importance of the soul does also improperly identify himself with the Supreme Brahma. So Krsna Consciousness Movement is meant for defying both classes of men; namely the karmis and the jnanis or yogis. That is our mission. Now among our students those who are advanced should take up this matter more seriously, and the Movement which you have started may not be stopped for want of adequate preachers - that is my request to you all. I am very glad to know that Kirtanananda Maharaja has now taken up this matter seriously and is preaching. Similarly I expect our advanced students like you, Rupanuga, Bhagavan das, Brahmananda, etc., may be seriously engaged now for preaching this cult. Yes, I have received the tape as well as your Chant booklet. I am sorry they were not acknowledged earlier. I have asked Boston to send you the KRSNA tapes for part II. They are already edited, and it is nice, still you can have a final glance over it. After your final editing is the work retyped by Syama dasi. If I go to Vrndavana, I will go during Janmastami festival there to see how Kirtanananda Maharaja has arranged. We have to make program that the Janmastami ceremony is held in New Vrndavana with great pomp--as much as the Rathayatra festival is to be performed in San Francisco. Similarly I propose to have great festival in Honolulu which is now New Navadvipa. This festival is to be observed during the Advent of Lord Caitanya's birthday. In this way the students should meet in these different important places at least 3 to 4 times in a year so that the work in different centers may go on uniformly. Please accept my blessings and offer the same to Govinda dasi. I am in due receipt of your letter dated 19th May, 1970. Formerly I thought I shall go along with Brahmananda, but later on I am sorry I was obliged to disappoint you on account of feeling not very enthusiastic to travel. Another point is that I am engaged in finishing the KRSNA book, and if I go even for 15 days, the progress will be halted. Another point is that in this new Temple Presidents from other centers are coming almost daily, and up to the end of May there are already engagements. So all these combined together hold me for the time being not to leave station; but don't be disappointed, as soon as I get opportunity I will come to you. In the meantime, if yourself and Govinda dasi both come here, it will very much engladden me. Brahmananda is going to Japan via Honolulu, and you will talk with him about improvement of our New Navadvipa scheme, and we will cooperate with you in all respects. If you want more hands, that will also be given. And if both of you think that my presence also is very necessary, I don't think it is now very necessary, I shall not hesitate to go immediately. On the whole, all you experienced and advanced students have to manage things very nicely, and if you occasionally come to me here for consultation and necessary instruction that will be easier for me and I can devote my time in finishing the books. You sent three tickets out of which two are returned herewith, and one will be utilized by Ananda. Ananda is a very nice boy, silent worker, I think he will be of great help to you. For further talks you will have good opportunity meeting Brahmananada. I shall be also very glad to know how Srimati Tulasi Devi is growing, and please send some Tulasi seeds to me here. Please accept my blessings. I thank you very much for your letter dated May 17th, 1970. I am very sorry to learn that you have been victimized by a rascal who claims to be Lord Krsna. You are an educated boy, and I am surprised how you have been so befooled as to accept an ordinary man as Krsna. Anyway, Krsna has saved you by causing your failure in the examination, otherwise you would have been more entrapped by the spell of this so-called "Krsna." Krsna's further mercy upon you is exhibited that you are now living in our Temple. Our different centers are specially meant for reclaiming sincere souls to understand Krsna Consciousness, and if you are more serious about Krsna Consciousness then you should not only read our books and literatures with due care, but also if possible you should come here and live with me for some time. You have mentioned about your dilemma between Krsna and your parents, and in this connection I may inform you that parents are available in any kind of birth. Either you take your birth as a human being or as an animal, there is a set of parents. But Krsna is available in the human form of body, so Krsna is more important than the parents. So do not miss the opportunity of your present human form of body. Try to understand Krsna, and make you life successful. I thank you all very much for your Aksoy Treetiya card. This is the new years day of the appearance of Satya Yuga. Satya Yuga means the age when people did not know anything except the Absolute Truth or the Supreme Personality of Godhead. In Srimad-Bhagavatam we begin our reading by offering of obeisances to the Supreme Truth Satyam Param Dhimahi, so those who are strictly on the Bhagavat line or in Krsna consciousness actually they are living in Satya Yuga age. Our London Temple is replica of Vaikuntha, so live there peacefully, chant the regular beads, and follow the regulative principles. I am so much thankful to you for your respective presentations - they are as follows: one golden cup, mysore sandal soap, some scent in snuff box, one picture of London Radha-Krsna Deities and one xeroxed interview report. So I shall be glad to know what is the contents and its formula in the box, then I can use it as snuff. I beg to thank you once again for these gifts. Hope this will meet you all in very good health in Krsna Consciousness. P.S. Where is Mukunda & Janaki please inform. Re: My Savings Bank Account No. 29/12802. With reference to your letter No. Sb/34/2978, dated 5th May, 1970, I beg to inform you that Mr. M. M. De is my second son. When I left home, as a dutiful father I left some money for my family as future provision, So practically the money belongs to my sons and daughters, and I never thought that in future it would be difficult to transfer the money, otherwise I would have distributed the money while leaving home. So the purpose of the remittance you have asked to send is to transfer their money to them. I hope this particular will be sufficient. I advised you to transfer Rs. 5,000 to the savings bank account of Mr. M. M. De with the United Bank of India, Dharmatalla Street Branch. I understand that you have already transferred Rs. 1,000, and the balance of Rs. 4,000 may now be transferred on the strength of the above statement. Re: My account No. 836-237 with you. Please transfer $3,600 (Three thousand, and six hundred dollars) to the First National Bank of Boston, Brighton Avenue Branch, in favor of account No. 516-5642, ISKCON Press, and charge the same to my account as above mentioned.